New York Comic Con (NYCC) has announced a number of changes for this year’s show (to be held October 3-6, 2019). First up is the NYCC badge pre-sale, coming on May 4. This year, only those who are fan-verified and who also attended in 2018 will be eligible for the pre-sale. Additionally, children attended on a child badge with their parents, but will be 13 this year, are also eligible. Exclusive to the pre-sale will be 4-Day badges, which make a return (in 2018, all attendees had to buy single day badges, even if they attended the entire con). For those who don’t qualify for the pre-sale, the general sale will be held on June 12. While fan verification is required to participate in the general sale, attendees will be able to purchase badges for those who are not fan verified. 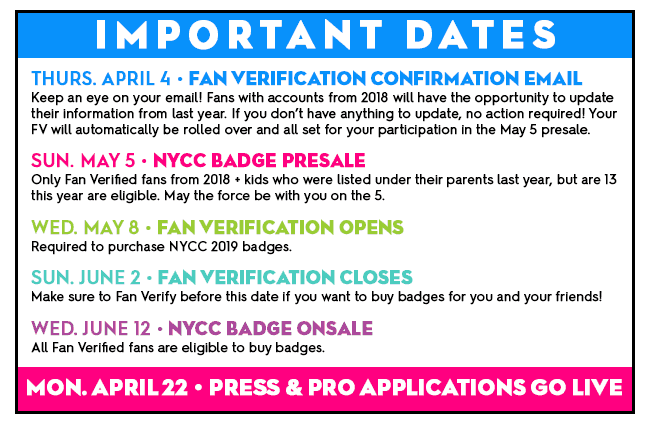 This is a step back for NYCC, which has been requiring fan verification for all badge purchases for a few years. It will now be possible to purchase badges for other guests who are not fan verified. However, ReedPop still strongly recommends that everyone be fan verified, as this will be required to participate in show lotteries. Attendees will definitely want to participate in the show lotteries, as they are being expanded this year. In addition to having lotteries for panel seating at the Main Stage, there will now be panel lotteries for events held at the Hammerstein Ballroom and Madison Square Garden. The Main Stage will still be completely cleared after every panel, while only the reserved section will be cleared between panels at Hammerstein and Madison Square Garden. As if these changes weren’t enough, NYCC has also announced that attendees who purchase badges and find themselves unable to attend will now be able to officially re-sell those badges using the online service Lyte. Fans who were unable to purchase badges in the online sales will be able to sign up for a waitlist to purchase returned badges through Lyte. ReedPop introduced the Lyte resale system at Emerald City Comic Con this year, and it was well-received by fans. With all of these new adjustments, NYCC is certain to be a fresh experience for fans attending in 2019. What do you think of these changes? Join the conversation on the FoCC forums!